We have five new polls today, all in battleground states. In Arizona Bush has retaken the lead, but it is still within the margin of error. Bush is thought to have a much better chance there than in neighboring New Mexico due to a larger population of retirees, especially from conservative areas of the Midwest. Bush has also barely retaken the lead in Tennessee, which was not supposed to be a battleground state, but with four consecutive polls taken by two different pollsters saying it is a statistical tie, it is shaping up to be one. Bush won Tennessee in 2000, but Clinton won it in 1996 and 1992. A new poll from Survey USA gives Kerry a 12% lead in Pennsylvania, the largest he has ever had there. 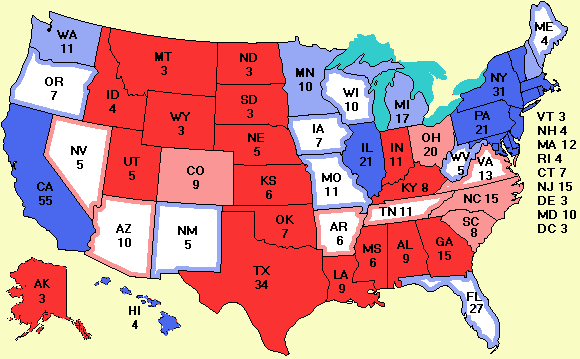 With 21 electoral votes, one more than Ohio, this state may be tough for Bush to win back. A 12% lead is very large for a state that was perceived to be a real squeaker. Rasmussen also released four tracking polls. The results are as follows. All of these polls were taken daily from July 1 to July 31. The trouble with that strategy is that although it makes it easy to compare these results with Rasmussen's tracking poll taken a month earlier, it is hard to compare them with, say, a Zogby poll taken July 28-30. Our rule of "Most recent poll wins" in fact applies to the middle date, so we count Virginia, because the previous poll was July 5-8, but don't count the others because in all three cases there is a much more recent poll. The net result in the electoral college is that Bush is chipping away at Kerry's convention bounce, bringing Kerry's lead in the electoral college down to 76. The XML icon above links to this file. I would like to thank Tim Bray, one of the co-inventors of XML and a popular blogist for introducing me to RSS feeds and helping me get a feed going. With today's information overload, feeds are fast becoming an excellent way to manage the flows. A number of people responded to the story Monday about the problems with the touch-screen voting machines. These problems have been widely discussed, especially on the Internet. Several people suggested that if you really want to make sure your vote counts, you should request an absentee ballot, even if you will be at home on election day. Elderly and disabled voters do this routinely. Saying you have a business trip planned for election day will probably put the county clerk in a better mood than saying you don't trust their voting machines though. Finally, the popularity of this site is growing by leaps and bounds. We have now passed 30,000 daily visitors and are rated #1 by Google, Yahoo, and MSN for searches on "electoral vote" (but not "electoral college" for some odd reason). The RSS feed will no doubt bring in more visitors. For the newcomers, welcome. In addition to the daily map, the site also contains a wealth of information about this election, previous elections, politics in general, books about politics, the Bush administration, links to other election sites, and and even some political humor and a cartoon of the week. All of these can be reached by scrolling down to the menu items below the map. Good places to start are the Welcome page and the FAQ.